I have improved my software development practice by building a Visual Studio extension. This extension has boosted my productivity by enabling me to rapidly generate user story modules to support my emergent design practice. One extension that I have built to support my development efforts is the UserStory project template. This project template can be downloaded from the Visual Studio gallery or from Visual Studio’s Extensions and Updates dialog. Select Tools | Extensions and Updates. Ensure the Visual Studio Gallery is selected. Type “Bizmonger” in the search bar. 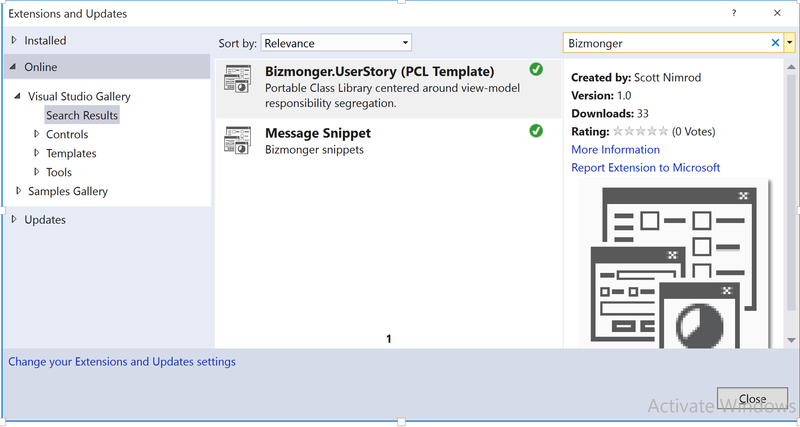 Bizmonger.UserStory is a portable class library that serves as an individual module for an arbitrary user story. I wrote this extension to support architectures that are organized by user story modules instead of relying on obscure folder names like “Views”, “ViewModels”, and “Model”. For example, when viewing projects within a solution that supports a user story driven architecture, one would observe projects that are actually based on the user stories that the software was intended for. For example, there could be a module called “Login”. Another module could be called “ViewProfile”. Thus, there could be another module within the solution called “EditProfile”. That app supported two user stories. One user story involved enabling a user to choose from a menu of clips so that he/she could place textual content on a clipboard and then paste the content onto a text message or email. That user story was called the ViewMenu module. The other user story involved editing content in order to update and archive the content for later use. This was done in the EditContent module of the app. Type “UserStory” in the search bar. Select the UserStory project and assign it the name: ViewMenu. 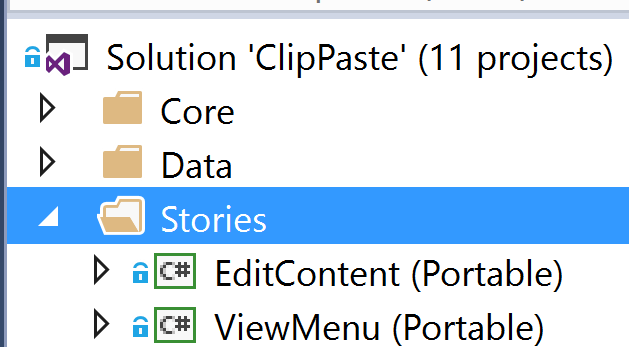 NOTE: I created a folder called “Stories” add moved the project under it. 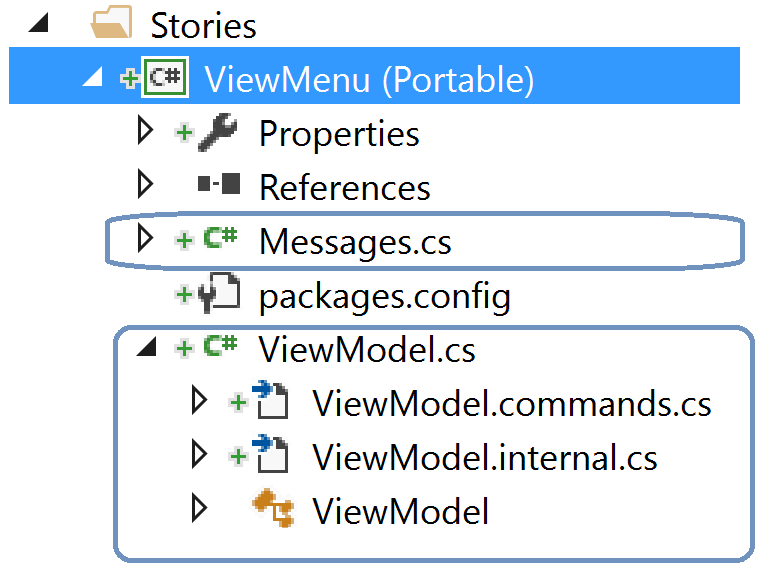 In the project, you will observe an expandable view-model. I call this type of view-model a Composite ViewModel. A Composite ViewModel is a set of partial view-model classes. Each partial class of the view-model isolates a specific responsibility of the view-model. I discovered this structural pattern after growing tired of maintaining monolithic view-models. I was just fed-up with having to scroll up and down the editor of a view-model class just to either debug or extend it. The Messages class contains user-defined message ids that can be placed on the MessageBus to dispatch notifications to decoupled subscribers of a message. The composite view-model parent node is responsible for initializing commands and conveying state. Specifically, it registers subscriptions, instantiates commands, and conveys state. ViewModel.commands isolate the behavior of the view-model from its state. ViewModel.internal manages internal state through its encapsulated logic. Name the test project: “ViewMenu.Tests”. Observe the “ViewMenu.Tests” project is added to the solution. Go ahead and run the test. In conclusion, I have improved my software development practice by building a Visual Studio extension. This extension has boosted my productivity by enabling me to rapidly generate user story modules to support my emergent design practice. 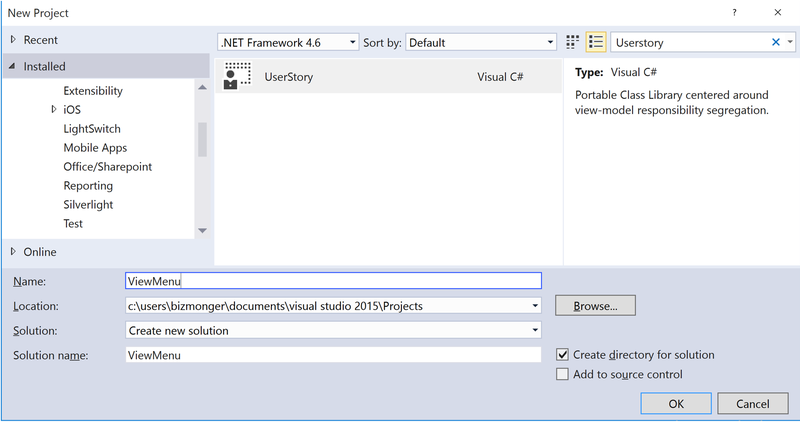 Thus, I have shared a tutorial to get developers started with this visual studio extension. I then provided additional steps on how to unit test a user story module. I welcome feedback. Previous Previous post: Are you a Professional Debuggerer? The user story project organization is intriguing. How do you handle the organization of shared functionality? Hi gregsdennis. Shared code is extracted into a separate library. I have provided screen shots on related articles that I’ve wrote. Here’s a link.